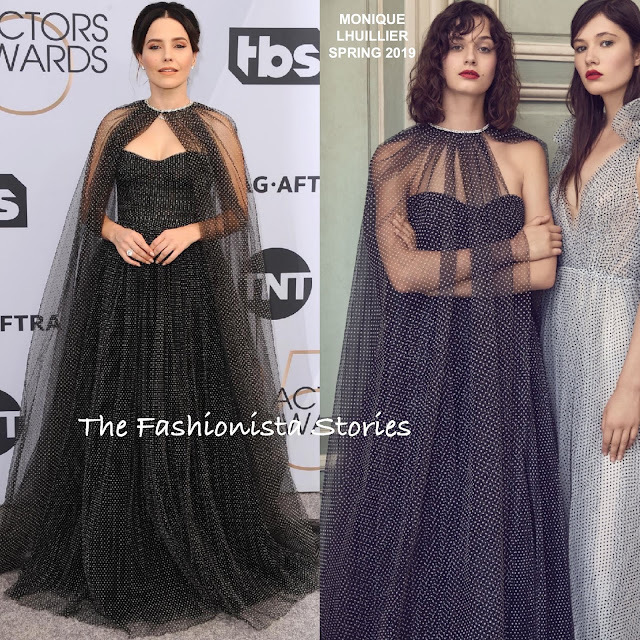 This evening(January 27th) Sophia Bush and Elisabeth Moss chose MONIQUE LHUILLIER for the 25th Screen Actors Guild Awards at the Shrine Auditorium and Expo Hall in LA. Sophia Bush chose a gown from the designer's SPRING 2019 collection. Her noir and silk white strapless sweetheart neckline ruched gown, featured a matching long gathered cape with crystal neckline. The hair is too Little House on Prairie for me, and I feel like the model is selling it more. Elisabeth Moss wore a FALL 2019 ivory glitter, and dot tulle strapless ball gown, featuring a gathered bodice and a contrasting black belt. Because of the drop waist, I don't think Elisabeth needed the black belt. Otherwise I thought she looked great. Kirby Howell-Baptiste once again came through beautifully wearing a pink strapless, jacquard gown with a dramatic, draped train detail in the back. Her beauty look was flawless which topped off her look along with DENA KEMP jewelry.